We travelled to Dartmouth on a bright and crisp autumn day. The reason for our visit, a meal at The Seahorse - a birthday present for my mother-in-law to be. Lunchtime was upon us as we boarded the higher ferry to cross the Dart so we headed into town to the only other place we’d heard about - RockFish! A warm welcome awaited us along with the promise of very fresh fish (as the strapline goes, so fresh tomorrow’s is still in the sea) and golden chips. We were spoilt for choice with a long list of seasonal fish and seafood, batter and breadcrumb options and the usual side orders of chips, mushy peas and curry sauce. Our meals were brought to the table in cardboard trays: breadcrumbed red gurnard and good old-fashioned scampi with tartare sauce, calamari with aioli and a crab sandwich on brown, accompanied by piles of chips and bowls of mushy peas. The fish was divine, the chips cooked to perfection and the mushy peas the best I've tasted! We received a nice surprise as we were leaving. Mitch was in the restaurant, on his break from The Seahorse kitchen further down the Embankment. He came over to say hello and ask if everything had been ok for us. He struck me as a cook and business owner who genuinely cares about and takes an interest in his customers and staff and is always looking for ways to make improvements (though we would have been hard pushed to find fault!). Parallels have been drawn between RockFish and Rick Stein’s fish and chip restaurant in Padstow but Mitch has got every detail of RockFish right and for me, there was no comparison. If lunch was this good, just how big a grin would we have at dinner? A walk around town and the sea air stoked our appetites for the evening. We donned our best bib and tucker and headed back into town. 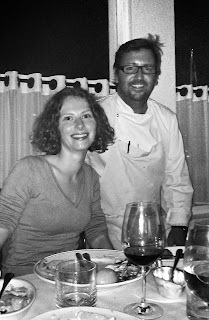 As we stepped out of the taxi, the large, heavy wooden doors burst open, we entered the warmth of the intimate dining room of The Seahorse restaurant and were greeted with a beaming smile and a wave from the kitchen. Glasses of prosecco were sent our way with a message from Mitch: 'congratulations on doing the double!'. We were astounded by the service we received, great service so often a rarity - the staff were friendly, attentive, extremely knowledgeable and obviously passionate about the restaurant. They talked us through the menu, brought out the fish from the kitchen for us to see before we made our decisions and knew just when to leave us be. The large window dividing the kitchen from the dining room means that Mitch can keep a constant eye on proceedings. Messages from the kitchen and dining room were constantly being relayed to all the staff, including news of my mother-in-law to be’s birthday. Mitch's approach to the food is simple - let the fish shine through. We chose starters of red Mediterranean prawns, grilled and dressed with olive oil, spaghetti with prawns and cardoon in a rich tomato sauce which had a deep shellfish back note, mussels from the nearby Elbury Cove which were packed with flavour and the zuppa di pesce - it came, was eaten and the dish refilled! Following the stunning starters, expectations were high for our main courses and were exceeded: sea bream cooked en papillote with roast garlic, chilli and rosemary - strong flavours but delicately applied to the fish; John Dory which had been given an Italian treatment with a tomato, anchovy and olive sauce; skate traditionally served with black butter and capers, and fritto misto (a selection of crisp fried monkfish, John Dory, red mullet, prawns, whitebait, squid and chiperones) which overflowed from the plate! Towards the end of service Mitch came out from the kitchen to talk with his guests – not in a pretentious way and expecting praise but to actually talk – though, yes he did sign books and menus, say ‘Happy Birthday’ to the birthday girl and have his picture taken with me too! As a coincidence, Mitch Tonks’ Fish cook book is being reviewed at this month’s Cookery Book Supper Club. 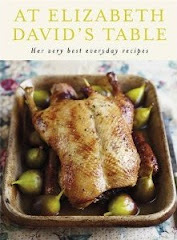 I had spent the previous couple of weeks reading, testing recipes and tweeting about the delicious dishes I had created. RockFish, having picked up my tweets, told me that Mitch was really interested in what we were doing so, of course, there was one obvious topic of conversation when he reached our table. Unfortunately Mitch is unable to make it to book club on Tuesday but I did offer him an open invitation for whenever he is in Bristol! There's no doubting that Mitch Tonks is at one with the fish he sources from Brixham fish market and knows how to make your day, evening, or even year! We have decided to do something a little different in June and will be any reviewing books by Elizabeth David. Our next meeting is on Tuesday 26 June at 7.30pm. If you'd like to join us for the next meeting, email us at info@cookerybooksupperclub.co.uk so we know how many to cook for! Please do let us know if you're vegetarian - we'd hate for you to be put off coming or go hungry! Our meetings are held on the last Tuesday of the month from 7.30 to 9.00 pm. To help cover costs, we ask that you pay £5 if you bring a dish or £10 if you don't. Do you have a favourite cookbook? Maybe it's covered in stains and falling apart from overuse or perhaps it's one you can just sit and read time and time again in search of inspiration. Email info@cookerybooksupperclub.co.uk to tell us which is your must-have cookbook and why you'd recommend it - we may just have to add it to our list of books to review. Dukkah is an Egyptian spice mixture containing roasted sesame seeds, nuts, coriander and cumin seeds. It is usually served with bread and oil. First you dip the bread in the oil then dunk in the dukkah. A taste explosion. As an alternative to normal breadcrumbs when coating fish, chicken or maybe even a veal schnitzel, try Panko breadcrumbs. Panko are Japanese breadcrumbs made from bread without crusts. When fried, the result is a much crispier and lighter coating than can be achieved with normal breadcrumbs. Panko are available online, in oriental stores and can now be found in the supermarket.